Things That Happen Everyday: Double Award, Double The Fun! In the last week I was given TWO great awards. 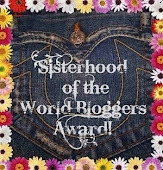 The Sisterhood of the World Bloggers from Meara from My Home Is With You and The Liebster from My Life In The Nuthouse. Honestly I don’t even know what’s going on here. Don’t get me wrong I’ve always know I was super cool (not), awesome (not), fantastic (not) but this, this is GREAT! Although not that great cause to be honest I’m not that interesting and these awards require you to list like 100 greatest things about me. Never one to give up here I go and hopefully you’ll stay awake for most of this. I'll like to thank both of these ladies for the nominations. I honestly do feel honored to get them. You are to thank the blogger who gave this award to you, include the logo in your post, note 7 things about yourself and pass the award to 7 other bloggers. Thank You Meara from My Home Is With You. I wasn’t even in the know about this wonderful woman. The obstacles she’s had to endure in the last couple of months would break anyone and she’s had to do it while caring for her two small kids. She really is an inspiration to all of us and I wish her and her family many years of happiness and joy. Even thought I didn’t know about her before I am so glad that she found me and I look forward to reading her blog for a long time. Thank you again Meara. 2. I love doing people’s hair even thought I never wanted to be a hairstylist. 5. I met my husband in Europe and brought him here to America. 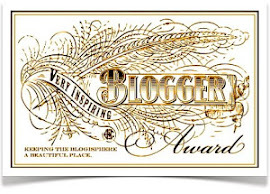 Here is the part where I nominated 7 awesome bloggers. Here’s the problem. I haven’t had a chance to explore many new bloggers lately and all the ones that I do read have already been nominated like 100 times and I’m sure they would kill me if I put their name down. Don’t misunderstand. We are all grateful and love the attention of getting these awards but a person has only so many 7 random facts to come up with. So here’s what I propose; if you’re reading this post and you have a blog and you have 7 more random, significant, insignificant, interesting, boring things that you would like to share with us…..YOU WIN, I’M AWARDING YOU THE SISTERHOOD OF THE WORLD BLOGGERS! Also let me know that you’ve done a post because I would love to meet some new bloggers or read more things about the bloggers I already know. 2. Answer the questions the tagger has set for you and then create 11 new questions for the bloggers you pass the award to. * I am really great with directions. I can go somewhere once and know how to get there next time without directions. However I work in Downtown Manhattan and I cannot for the life of me go anywhere around here. I get lost all the time. 1. What is your most frustrating moment in the morning? Waking up late and not having time for coffee on top of which my kids are all over me when all I’m trying to do is get ready and go to work. My husband has to take care of their needs Monday-Friday mornings. 2. What is the most embarrassing thing your child/children said when they were young. I don’t get embarrassed easily. The only thing I could think that would maybe embarrass me is I was in the supermarket with my little boy and he was sitting in the cart. I turned around to get something from a shelf and he yells “mom, mom here” so without looking I ask “what?” and he yells “bugger, I took it out and I don’t know what to do with it”? 3. What is the grossest thing you have found in the laundry from your little ones/husband? Nothing yet, this is because my kids/hubs throw their clothes all over the house most of the time and I put it in the laundry basket. 4. What is the best job you have ever had? Staying at home with my first son for the first 2 years. I so wish I had this with my second boy. 5. What is the worst job you ever had? I worked in a sweat shop factory when I was very young (yes in America). I’ll never forget the smell of the people or their food. I know it’s not their fault but OMG it’s a smell that stays with you for life. 6. Least favorite thing you have to do daily? 7. How many minutes to get for your shower? I’ve reached a point where I take as long as I want. This however means that I have to turn off my shower at least 3 times and say “yes honey” (listen to what they say) and than say “ok, I’m taking a shower now can you tell your dad”. 8. What is your favorite comfort food? I love potatoes. Send me on an island with only potatoes to eat and I’ll be happy. 9. What is the nicest compliment your better half has ever said to you? I asked him once why he chose me to marry and he said I was the first girl that said no to him. He liked that I had a mind of my own and had my own opinions. To become famous….NO. Mainly because I read a couple of bloggers and thought hey I got stuff to say and maybe just maybe someone would be interested in reading it. 11. What do you like most about a man? 1. If you could go back in time would you still marry the person you are with now? 2. How do you feel about Overachieving Mom’s? 3. What does your husband do that pisses you off the most? 4. If money, patience and childcare were no object how many kids would you have? 5. Who is your favorite blogger (less than 200 followers)? 6. If you could switch lives with anyone (famous or not) who would it be and why? 7. What type of doctor do you hate going to the most? 8. When you were little what was your dream job? 9. What is your greatest fear about your kids? 10. What is the one thing in your life you cannot live without? 11. What is a secret thing you do that only certain people know? Same rules apply as above about nominating bloggers for this award. I wholeheartedly support cutting people off, even relatives. I've actually been meaning to post about that. What flavor Chapstick do you use? I can't live without strawberry. Any flavor is fine as long as its not those minty Chapsticks. This is so cool- congrats! Congrats on your awards! As for #1: That simply can't happen at my house. Not having my morning cup of coffee is not an option. Do you have a Keurig? They make it so easy to make a quick cup. I also save to-go coffee cups just for that reason: If I'm running late, I pop a K-cup in the Keurig and use one of my many to-go cups and I'm on my way! Hope this helps. :) You used great facts about yourself--this is my first visit, and I feel like I know you already. Looking forward to more posts!! Thank you. I should have clarified #1. Just because there is no time for coffee does not mean I won't have coffee. Like you said not having coffee in the morning is not a option. I will be running late to whatever but I will have my coffee. I actually do not have a Keurig. I'm thinking of getting one. I have one at work at its great. Thanks, looking forward to having you here!